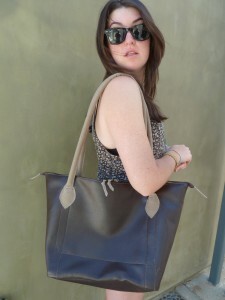 Great travel-all purse in “no-animal” leather. About 15″ X 20″ it’s perfect for computer, books, overnite or under airplane seat. Easy to use double zippered top with inner pocket. Beautiful and sturdy tapestry lining. Works for men or women. By custom order in many colors and variations of fabrics, we also make this bag in real leather and suede, in many colors, patterns and combinations. Check our products pages for ordering information.